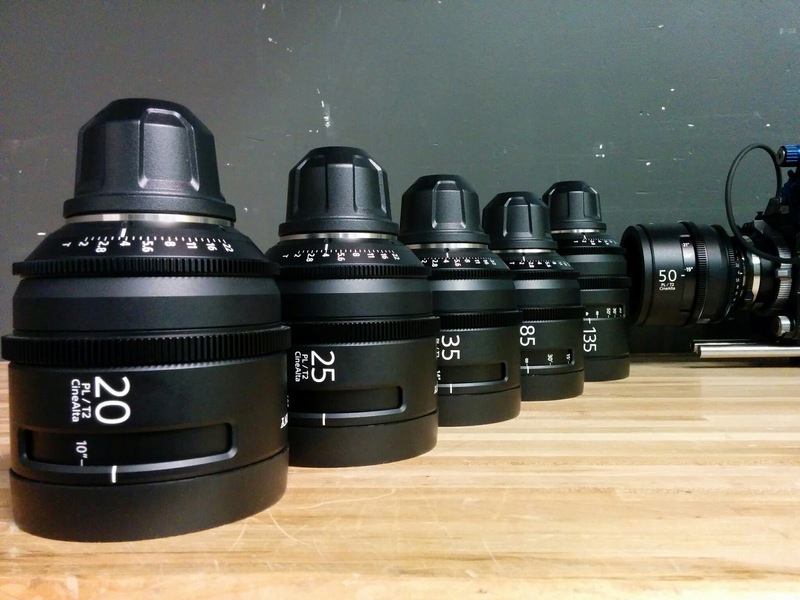 Earlier this month I received my first set of PL mount lenses, the Sony CineAlta T2 set. Now, they aren't super common and my set is the first I've actually seen in person. They have a nice clean, modern look and are pleasantly sharp. Many people have compared them to the RED Pro Prime lenses, but I feel like these are slightly less sharp in a good way, helping to soften up the digital look that can become apparent with the RPPs. Build quality is top notch, with smooth, even dampening on the focus and iris, and a full metal cine housing with proper cinema focus rotation (which should make my AC happy after all the Canon lenses he's suffered through). All the ring spacing is the same, so follow focus gears/motors don't need re-positioning when switching lenses. All lenses except the 135mm are the same length, so the matte box doesn't need to be adjusted either. Immediately after receiving them, I took them over to an acquaintance's place and we put them up on one Epic Dragon, with a Fujinon Cabrio 19-90mm zoom on the other. Side by side, they were fairly similar, with just a slightest of color shift between the two. Optically, the Sony set seemed to pull just a bit ahead on some focal lengths while drawing neck and neck on others. The Sony's even seem pretty sharp wide open. They do tend to exhibit some CA on super high contrast scenes, but I was pushing them to their limits by shooting with a contrast ratio that I certainly would almost never shoot in a real life situation. 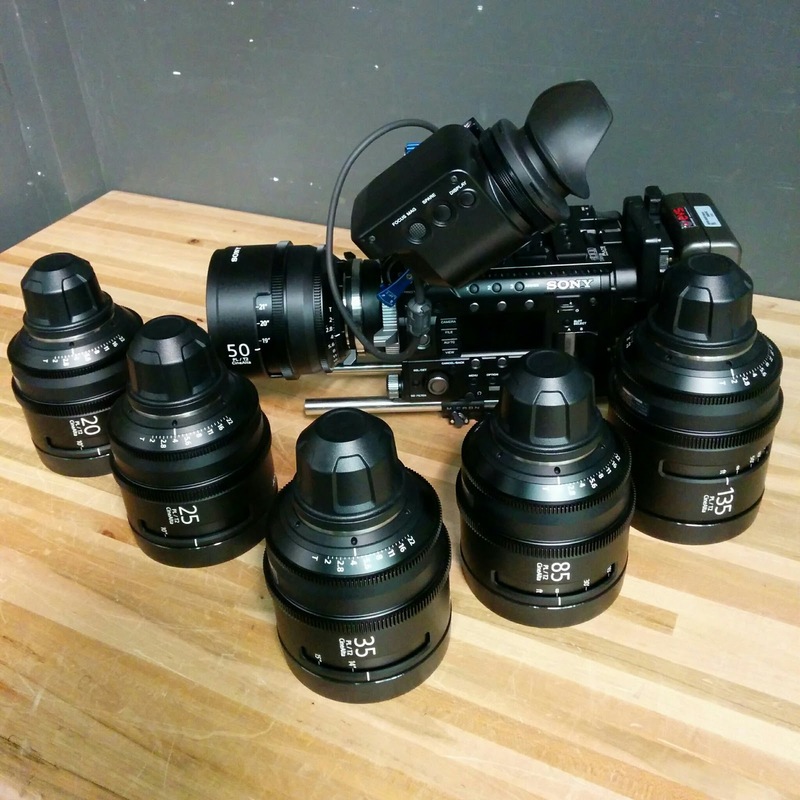 Today I put them on a Sony F55 to conduct further testing and liked what I was seeing. While these are obviously no Master Primes, I'm very pleased with how nice they look, performing better than I would have expected at this price point. I'm a bit surprised that I've never seen these lenses around before. Perhaps people are put off by their size and weight (they are a bit large and heavy). Or maybe because Sony isn't a well known lens name (it's speculated that Minolta -who has a long history of making lenses- supplies the glass, seeing as how their camera and lens business in now owned by Sony). Whatever the reason, I'm happy to have this new set of lenses and am eager to put them to work.